A gray, ashen palette. Hypercaffeinated quick cutting. Low-rent digital effects. Some sort of nu-metal/mallcore soundtrack chugging away at eighteen quadrillion decibels. The subwoofer whacking away like a sledgehammer to punctuate the lazy jump scares that crop up like clockwork every eight minutes. 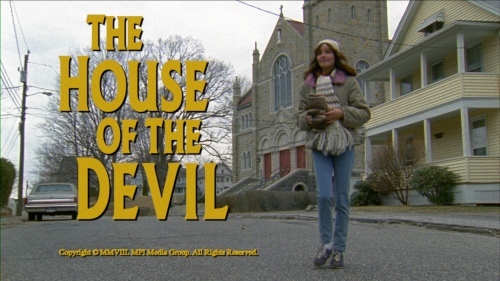 It's not hard to wind up feeling disillusioned with all of the interchangeable horror flicks coming down the pike these days, but as you could probably guess from the title card up there, The House of the Devil veers off in a completely different direction. The House of the Devil may not actually have been shot sometime around 1982, but it might as well have been. Writer/director/editor Ti West and his crew have recreated the era down to the most minute detail, from a Walkman the size of a brick to Farrah-feathered hair all the way to those red, waxy Enjoy Coke! fast food cups. Even the grainy photography, muted palette, and the slight optical jitter of the opening titles are pitch-perfect. West only loses out on complete authenticity in one way, and that's...well, that The House of the Devil is so much better than the bulk of the horror/suspense flicks I grew up with in the '80s. restraint of The House of the Devil impresses me more than just about anything else about it. West's screenplay isn't overwritten or littered with smugly witty dialogue. There aren't any awkward pop culture references to try to sell its early '80s setting. There aren't any cheap jump scares, to the point that someone could watch the overwhelming majority of the film and not clue in that it's a genre piece at all. The House of the Devil is stripped down to bare metal -- one quietly charming, sympathetic girl stranded in a remote house, unaware how close to death she really is -- and that simplicity is an essential part of its strength. There's not much of a plot to rattle off, even. Samantha (Jocelin Donahue) has stumbled her way into the perfect one-bedroom apartment just off-campus, and the realtor (Dee Wallace) was even nice enough to waive all of the deposits. All Sam has to do is cover her first month's rent, but she hasn't really thought all this through so much, and she only has a few days to line up the couple hundred bucks she needs to seal the deal. As luck would have it, she spots a flyer for a babysitting gig, and the soft-spoken guy on the other end of the line is desperate enough that he's willing to pony up twice his usual rate. Guess it's another astronomy nut; at least, no one else in this sleepy little college town will shut up about how they have one of the clearest views of this lunar eclipse the world over. Her pal Megan (Greta Gerwig) drops her off at an oversized house half-past the middle of nowhere, and Meg's a good enough friend to try to browbeat it into Samantha that if it seems to good to be true, it probably is. This is after Samantha has learned that it's not exactly a babysitting gig, but four hundred bucks to sit around and watch TV for a few hours is too much for her to pass up. So what if the couple that owns the place (Tom Noonan and Mary Woronov) are creepy and then some? They're out the door after a few minutes anyway. It's just Samantha in a might-as-well-be empty house, whiling away the next few hours with one of the most deliriously awesome dance montages ever and generally nosing around the place. The more she skulks around, though, the more she starts to clue in that something's not quite right until...well, you know the title, so it kind of goes without saying that all Hell breaks loose. subdued yet spectacularly effective sound design, the film's grip is unrelenting. We know from word one that something terrible is going to happen, but the intrigue is watching someone so endlessly likeable and sympathetic gradually come to that same awful realization. So much of the movie rests on Jocelin Donahue's shoulders, and she's a phenomenal choice to play the lead. Samantha isn't saddled with reams of dialogue and doesn't have any overwrought backstory. Her personality comes through the way she carries herself -- the way she acts when she thinks no one else is there to see her -- and there's something immediately engaging and sympathetic about Donahue. In keeping with its mostly minimalist approach, The House of the Devil didn't have to go out of its way to convince me to like Samantha, and the fact that she radiates more than a little Suzy Banyon probably doesn't hurt either. Greta Gerwig is terrific as the spunky best friend...the one with more common sense than her mousy pal. It's probably worth noting that Megan and Samantha do pass The Bechdel Test, having several conversations that don't revolve around one of 'em trying to get laid or moping over a guy. The House of the Devil's supporting cast also includes turns by three genre vets. Dee Wallace (Poltergeist; The Howling) is in and out before any pentagrams have a chance to pop up, and Mary Woronov (Chopping Mall; Night of the Comet) makes an immediate impression as the sapphic-leaning wife in that creepy, remote house. Tom Noonan (Wolfen; The Monster Squad) is unsettlingly soft-spoken as the towering Mr. Ulman, stealing every shot he's in without ever overplaying it. Up-and-comer A.J. Bowen also makes the most of a small part and delivers the single biggest jolt of the film. Oh, and even though much of The House of the Devil is a deliberately slow burn -- one that builds on a classic approach to suspense as opposed to bludgeoning genre theatrics -- its final fifteen or twenty minutes are visceral and indescribably intense, exceeding anything I could've hoped to see from such an extended build-up. This is just a masterfully crafted film, horror or otherwise, on every level. It's a horror/suspense movie that could very easily be mistaken for something shot in 1982 yet never devolves into a cariacture. The House of the Devil is engrossing and unnerving despite its minimal dialogue and disinterest in overt scares. The cinematography, sound design, and especially the score are all outstanding. There's not a weak link or misstep anywhere along the line, really. Viewers weaned on Saw sequels and desaturated shakycam flicks might be bored with it, but for those of us who grew up with atmospheric, suspenseful horror like The Changeling -- a long-time favorite of mine and one of the touchstones pointed to in the extras -- The House of the Devil is essential viewing. Highly Recommended. The House of the Devil sets out to recapture the look and feel of a low-budget horror/thriller from a few decades back, and it pulls all that off exceptionally well, down to the Roman numerals and slight jitter in the opening titles. Shot on gritty 16mm stock, its buzzing film grain and gloomy, distinctively vintage palette certainly help the movie look that much more authentic. The House of the Devil doesn't go off the deep end with it like Grindhouse did a few years back, but there are even a few scattered specks as a reminder that this was shot on film. As gritty and grainy as The House of the Devil is, the grain structure is still reasonably tight, and the AVC encode never buckles under the weight of it all. The image is also nicely detailed; if The House of the Devil had been lensed sometime around 1983, this Blu-ray disc would have to be some kind of world-class remastering job. I know the usual kneejerk reaction is to assume that a grainy, low-budget movie -- especially one modeling itself after even lower-budgeted flicks shot thirty years ago -- doesn't really stand to benefit much from high-def. Anyone who's been keeping up knows that's not true, though, and as long as you're not turned off by that retro-leaning aesthetic, The House of the Devil really does look terrific on Blu-ray. The House of the Devil opens up the mattes slightly to reveal an aspect ratio of 1.78:1, and the film and its extras fit comfortably on a single-layer Blu-ray disc. flipside of the case only mentions a Dolby Digital 5.1 track, but The House of the Devil does sport 16-bit, six-channel DTS-HD Master Audio, and it sounds incredible. The sound design impresses despite a deliberately subdued approach. The House of the Devil is a slow burn, after all, and spastic surrounds and twenty-eight megaton waves of bass would be completely out of step with that tone. The film fleshes out an incredibly convincing sense of atmosphere, and especially as Samantha skulks through the seemingly empty house, the extensive use of imaging and other discrete effects are unnervingly immersive. As the climax approaches, The House of the Devil unleashes a hellish amount of bass: a devastating low-frequency rumble and a pounding, punishing heartbeat in particular. The movie may be modeled after something fished out of the '80s, but The House of the Devil certainly doesn't sound like some monaural drive-in flick remixed to 5.1. It may not be littered with awkward pans or gimmicky surround effects, but the film benefits greatly from being experienced on a full-bodied home theater rig, and the distinctness and clarity of every last element in the mix all come through flawlessly on Blu-ray as well. I definitely feel obligated to give a nod to the music scattered throughout the film. There are a handful of licensed songs that help sell the setting, sure, and the choices are more inspired than what I'm used to hearing on '80s period pieces. I'm nerdy enough that I even have an autographed Fixx CD on the shelf, so hearing them showcased on the soundtrack so prominently was kind of a blast. The original music manages to be even better, though, starting with the synthy stomp over the titles that's a perfect recreation of something I'd expect to open a horror movie with this sort of backdrop. The slow, plinking piano keys that drive the first couple acts of the film are unsettlingly eerie, leading up to the violent, stabbing strings that attack during its final fifteen or twenty minutes. The House of the Devil's original score impressed me so much that I felt compelled to pick up the soundtrack afterwards; I'm not sure if a CD was issued, but iTunes carries a double feature soundtrack with the original music from this film and I Can See You for $9.99. Also included are a stereo PCM track and subtitles in English and Spanish. Audio Commentaries: Writer/director/editor Ti West is the driving force of both of the commentary tracks on this Blu-ray disc. There's surprisingly little overlap between them, and both are well-worth a listen. West is joined in the first track by actress Jocelin Donahue, and among the highlights here are how ambitious the music licensing is for such a low-budget movie, pointing out a few background gags, pitchshifted stand-in sniffles, the challenges of striking such a delicate tone during post-production, and the poor schlub who decided to hold onto a Volvo that the production bought on eBay yet not realizing just how much splatter would be sloshed around with a gunshot to the head. If you're curious about the budget and how tight the shooting schedule was, West spells out both of those here as well. but still manages to be extremely personable...not just a bunch of jargon being rattled off for an hour and a half or anything. Shaping the look of the film, describing how to simulate the sound of a girl peeing, eBay making production design of a low-budget period piece a breeze, how easily "Regulators" can stand in for The Fixx, and noting which scene had been yanked out to see how the movie would play to potential distributors are just a few of the topics of discussion this time around. Again, they also point out some of the background flourishes that I missed the first time through. The one misstep with this commentary is that not everyone is mic'ed all that well, and some of the comments can be a little tough to make out. In The House of the Devil (14 min. ; SD): This candid behind-the-scenes montage tackles most of the major sequences in the film, offering a lengthy look at the crew at work, the grisly make-up effects, and a different perspective as the 16mm camera rolled. I particularly enjoyed seeing the retro flourishes being yanked out of the house at the end, and the sight of one of the actors in full make-up and ordinary street clothes blowing out candles on a birthday cake winds up looking cacklingly demented. Behind The House of the Devil (5 min. ; HD): The disc's other featurette breezes through each of the characters, touches on the film's more realistic approach to horror, and runs through the Satanic panic and the breakdown of communication that go with its early '80s backdrop. Deleted Scenes (7 min. ; SD): Ti West mentions in one of his commentary tracks that this was such a lean movie that there really wasn't much to cut. Pretty much the entire reel revolves around one scene: Samantha chatting with Megan on the phone about her new pad. It serves up one version from Sam's perspective, with the camera swirling around the payphone she's using, and the other take is set inside Megan's dorm room. The tone's kind of goofy and cartoonish, and it doesn't really gel with the rest of the movie, but it's nice to see it tossed on here anyway. The only other footage is Mother skulking down a hallway, and there's not really enough meat to gnaw on to call it a scene, exactly. All of this footage is timecoded and letterboxed in non-anamorphic widescreen. Trailer (2 min. ; SD): A standard-def theatrical trailer rounds out the extras. I'm an easy mark, and even if The House of the Devil had just been a schlocky, campy homage to '80s horror, I probably would've given it a thumbs-up anyway. This is anything but some sort of mindless, smirkingly retro riff, though. The House of the Devil doesn't celebrate or poke fun at the early 1980s; it wholly escapes into that era. Immersive and unnervingly intense, it's superior to the overwhelming majority of genre films from the era in the first place. I think some level of appreciation for a more classic, atmospheric approach to suspense is necessary to get much out of it -- this is a slow, methodical burn where the lead character spends half the movie wandering around a house, after all -- but this easily ranks as one of the most exceptional horror movies of recent memory. The House of the Devil also looks and sounds fantastic on Blu-ray, and both of its audio commentaries are essential listens. If anything, the only stumbling block with picking it up in high-def is that there's a limited edition DVD release that comes with a VHS copy in an awesome Gorgon-style clamshell, and there disappointingly isn't an equivalent for the Blu-ray set. That could make which version to buy a toss-up for collectors, but regardless of which format you opt for, The House of the Devil is a movie that screams out to be discovered. Highly Recommended.